Your baby grows more in the first year than any other time. Providing the right activity and nutrition can make a real difference. Physical growth vs physical development: What’s the difference? Your baby's physical growth refers to increases in his length and weight. Development refers to his ability to engage in more coordinated actions and thought processes. In addition to physical development, the first year is crucial for cognitive, social, emotional, and language skills. All infants grow at different rates. While there are general guidelines, there's no reason for concern if your baby is above or below the average. Birth to 6 months: you can expect growth of 1.3 to 2.5 cm a month and 0.14 to 0.2 Kg weight gain per week. * By 5 to 6 months of age, he might double his original birth weight. 6 to 12 months: expect growth of 0.95 cm every month and 0.09 to0.14 Kg of weight gain per week. * By 12 months, he might triple his original birth weight. Worth noting: your baby's specific height and weight are not as important as a steady rate of growth. 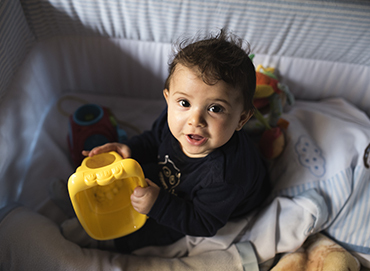 Interactive play—which in the first few months could be as simple as him lying on his stomach—can encourage movement and bonding, as well as critical developmental advancement. Infants need more sleep than older children, so be sure to alternate learning activities with sleep. Learn to recognize your baby's cues that sleep is needed. From pregnancy through your baby's first year, if you have any questions about what you or your baby should be eating, our Feeding Expert offers live nutritional support. No matter how minor, ask your healthcare professional about anything you’re unsure of. It's only a bad question if you never ask it. In the first few months of life, as the nervous system and muscle control starts your baby's movements transition from quick and jerky to smoother and more intentional. Gross motor skill improvement involves the large groups of muscles used to sit, stand, walk, run, keep balance, or change positions. Fine motor skills include using hands to eat, draw, play, or pick up small items. You can help strengthen your baby's muscle development and motor skills with simple activities and practice. By month 4, your baby has the muscle control needed to turn his head and follow objects. Within the first year, he should develop the ability to balance, sit up, crawl, and eventually stand. His fine motor skills also advance from clumsily raking objects in the early months to accurately grasping. Under your close supervision, place your infant on his stomach to strengthen his neck and back muscles. Get your baby's attention by holding a colorful toy and making an interesting noise. Always keep "tummy time" sessions short — about a minute or two should do it. Rolling a large ball to your baby allows you to interact with him and observe his developing skills. At first your baby will simply slap it back, but eventually he will learn to swat it in your direction. Put a graspable object (such as a rattle) in your baby's hand and tug on it very gently. This activity helps build muscle as your baby resists your efforts. Nothing encourages an infant to crawl more than a tower of blocks that is just out of reach and waiting to be knocked down. Around 4 to 7 months, gently pull your baby to a standing position. By this time your baby will start to understand the function of each body part, and start to use his feet and legs to bounce up and down with your help. This will help prepare your baby for walking. You can modify this activity for a younger baby by using a supported sitting position instead. Make an obstacle course out of light sofa cushions, pillows, or boxes on a carpeted floor. Invite your baby to crawl over or between them. You can even hide behind one obstacle and play peek-a-boo. Always closely supervise your baby while he's playing with pillows. 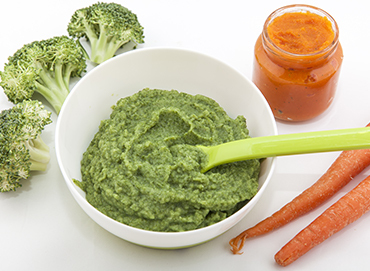 As you begin adding healthy snacks to your baby's diet in the later months of her first year (and with the approval of your pediatrician), finger foods are great for fine-motor practice, making each eating experience a fun learning time. Encourage your baby to pick up bites of fruit, cereal, or vegetables. Demonstrate how to do this and praise every successful snack. 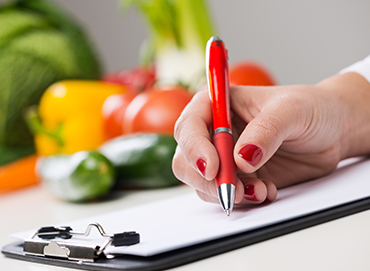 If you're not sure what kinds of foods to use, the Feeding Expert team is available to answer your baby feeding questions. From her very first cry, your baby is a capable communicator, even without words. Language skills involve speaking, of course, but also include body language and gestures, which are essential for proper communication. Infants learn to speak at their own pace, but you can help further her verbal abilities through activities and play. Your baby learns language in stages — by hearing people make sounds, watching them communicate, and then experimenting with making sounds. Your baby prefers human voices (especially yours) to any other sound. As early as 1 month old, your baby can identify your voice from a different room. Two months: Your baby smiles to communicate. Cooing begins with vowel sounds and soon will progress to consonant sounds. Five months: She is babbling, squealing, gurgling, and starting to imitate sounds. Name recognition will start to occur as her memory and attention span increase. She will start to understand what you're saying by distinguishing emotions from your tones. One year: She can follow simple instructions and might be able to say two or three words. Talk to her. A lot. Conversation in the first few months lays the groundwork for language development. Provide simple descriptions of what you and your baby see, hear, and smell. Use basic words to communicate ideas and emotions, and speak in an endearing tone. As she begins to mature, ask questions and give her time to gurgle in response. This pattern reinforces that communication is a two-way process. Your baby learns the subtle rules of conversation — taking turns, imitation, and pacing of verbal interaction. Continue this throughout the first year. Read to her. A lot. Reading aloud is the simplest way to boost your baby's language abilities. Set aside a short time each day for reading. She won't grasp the plot, but reading promotes speech and encourages sound imitations. Start with brightly colored picture books. Animate your reading with facial expressions, sound effects, and character voices. As your baby grows older, always keep a few durable books within reach. Your baby has been imitating your sounds since the beginning. When the babbling increases, repeat the sounds back exactly. Try to encourage her to respond and imitate you. Clap and cheer whenever there is a related response. Point out and name familiar people and objects. At about nine months old, start asking "Where's Mama?" or "Where's Dada?" Encourage your baby to find and look at the person or familiar object that you've named (such as a toy, diaper, or bottle). You also can make a photo album of family members, pets, or familiar objects. She might only stay interested in a book for a few minutes, but try each day. Remember to stay consistent with verbal labels. For instance, if you identify the cat photo as "kitty," don't switch to "cat" the next time you look through the book. It might seem strange, but periodically eliminating the sounds of the television, radio, or computer can strengthen your baby's language skills by giving her time to practice without distraction. Cognitive skills encompass your baby's ability to think, learn, understand, problem-solve, reason, and remember. From birth, your baby absorbs information and starts building cognitive skills — even if it's not obvious at first. In fact, the care and experiences you provide can affect the development of your baby’s brain. Every experience — from a simple cuddle to organized play — teaches your baby about the world. Helping him feel secure and engaged has been shown to increase mental aptitude. In the first few months, he might simply turn toward bright colors, lights, or a human voice. As his memory and attention span increase in the months ahead, he will start to apply knowledge through activity. He might use his hands and mouth to explore, find hidden objects, and imitate familiar actions. By 9 to 12 months of age, your inquisitive baby craves your interaction, which further fuels cognitive development. Read. Read. Read some more. It’s proven to promote thought development. In the first month, begin by reading almost anything aloud to your baby. At three months, move to brightly colored picture books that show common objects. In later months, create your own picture book with photos of familiar people or items. He might only be interested for a few minutes, but reading books every day will make a difference. Doing the same things over and over with your baby provides the practice that's needed to learn. As your baby matures, create a game out of repeating actions or words. This will build self-confidence and strengthen the connections in your baby's brain throughout the first year. Name of the game: Variety. Expose your baby to a variety of toys and textures, such as a soft stuffed animal, bumpy plastic rattle, or smooth wooden block. Because most objects end up in a young baby's mouth, always provide close supervision and be sure items are not too small. 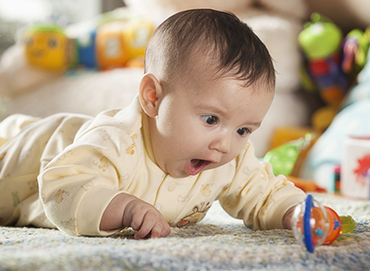 At first, limit toys to one or two simple, colorful choices to help your baby focus. As he matures, modify a toy or activity. For instance, place a ball inside a box. This small change challenges your baby's cognitive skills without frustration. The "cause and effect" effect. By 4 to 5 months, your baby will start to intentionally drop things to test this newly discovered ability to influence the environment. Give your baby wooden spoons, plastic cups, or small boxes, and make it a game. As he matures, move to interactive toys or activity boards. Show him that pushing a button creates music or opening a toy barn door makes a cow moo. Seeing the results of actions strengthens self-confidence. Provide safe opportunities for exploration. Fill an accessible drawer or lower kitchen cabinet with baby-safe objects that vary in shape, texture, and size for your baby to discover. He learns by dropping, rolling, and waving objects, and by fitting items inside one another. Play make-believe to reinforce names and functions. Give your baby props, such as a soft hairbrush, toy phone, toothbrush, cup, or spoon, and demonstrate the proper way to use each object. Give praise when he imitates the action. By 12 months, he will understand that items have both a name and a function. From crying to using facial expressions, your baby begins adapting to her new world from Day One. These early exchanges are an important part of her social and emotional development as she grows; skills that will include interacting with others, establishing relationships with family and friends, learning to work with others, and responding to others' feelings. In her first month, your baby will start playing with grins and grimaces. Around month 2, she’ll have mastered the social smile, realizing it gets attention. The more your baby engages with you, the less she’ll feel bothered by internal sensations such as hunger, gas, or fatigue. By a few months old, your baby should enjoy playing with familiar people and become more communicative and expressive. She might smile at a reflection, scream to show annoyance, and show preferences for certain people and specific toys. Additionally, she might be fearful of new situations, but with your help, she will be able to learn and accept new settings. Respond quickly to newborn needs. Research shows that responding to your baby's needs builds trust and helps your baby feel secure. This strong bond and confidence can help her settle herself without your help. Observe, understand, and embrace your baby's unique personality. It's important to understand your baby's character traits and behavioral style as completely as possible so you can best respond to her. For instance, an irritable baby might need cuddling or distraction to refocus energy, while a shy infant might need time to watch from a distance before becoming directly involved with others. Let your baby set the pace. When your baby turns away or gets fussy, take a short break from the activity you were just doing. Fear of strangers? Fear not. Around month 5 or so, your baby will recognize certain people, yet may fear those who are not familiar or regularly seen. To ease her apprehension, plan new introductions only when she’s well rested, healthy, and full. A comfort object such as stuffed animal or blanket can help her feel secure. Reduce separation anxiety with games at home. This common fear typically appears at 6 to 8 months old, when your baby becomes aware that you can walk away at any time. You can help make her more secure by turning the concept of separation or absence into a game. Start with a few seconds away, lengthening the time apart each time. As another practice activity, allow her to crawl into another room that's safe, but wait a minute or two before following. If you do leave your baby with someone else, ease the transition by not leaving immediately when the other person arrives. Grow self-awareness with mirror games. Around 12 months, stand beside your baby in front of a mirror and point out different body parts, such as your nose or arm. Have your baby do the same. Move in and out of the reflection for mirror peek-a-boo. You and your baby can make faces to display various emotions you suggest. Introduce your baby to brief play dates for group play practice. Although there won't be much interactive playing yet, time spent with other children establishes a strong social foundation for the years to come.